Walsall grabbed a well-earned draw against League One leaders Bristol City thanks to Romaine Sawyers' late strike. Joe Bryan put the visitors ahead on 11 minutes with a right-footed shot into the corner from Luke Ayling's cross. Aaron Wilbraham could have doubled City's lead but he fired straight at goalkeeper Richard O'Donnell. The Saddlers created few chances after the loss of top scorer Tom Bradshaw but Sawyers curled a superb shot into the top corner five minutes from time. Walsall striker Romaine Sawyers headed off after the game to link up with the St Kitts & Nevis squad for this week's three Caribbean Cup games in Port-au-Prince against Barbados (8 October), French Guiana (10 October) and Haiti (12 October). He misses Tuesday night's Johnstone's Paint Trophy tie at Rochdale and next Saturday's League One trip to Oldham Athletic. Bradshaw limped off on 35 minutes with a hamstring injury that will scupper his chances of an international call, having been on standby for the full Wales squad. Bristol City extend their unbeaten start to the season, although their lead at the top has been cut to four points, while Walsall move up one place into 16th. "Hopefully I can keep this form whilst I am away and then be able to maintain my high standards when I return from international duty. "It was nice to see the ball hit the back of the net. It was a really good team goal with some neat play in the build-up. "It was a great performance against another of the top teams. We always seem to perform against the better sides. Maybe it's because they come here trying to impose themselves on the game. "We kept believing. At half-time, the gaffer told us to keep doing the right things and we got our reward. In fact, we were a little disappointed that we didn't come away with all three points." "I think they're a good team. There were a couple of teams that I knew we would play against that don't get a lot of profile. But one thing is for sure, their manager and players work extremely hard. "One was obviously Walsall today and the other was Rochdale, So I think we'll look back at this period of the season and think that these were two very good points. "Second half we had to show a different side. I thought we were organised and the spirit was fantastic. They covered yards and yards, for each other. "The one thing we didn't do was, we were not quite ruthless enough with our attempts on goal and we didn't stop one shot we didn't block one shot." Match ends, Walsall 1, Bristol City 1. Second Half ends, Walsall 1, Bristol City 1. Foul by Mathieu Manset (Walsall). Luke Ayling (Bristol City) wins a free kick in the attacking half. Attempt missed. Aaron Wilbraham (Bristol City) header from the centre of the box is close, but misses to the right. Corner, Bristol City. Conceded by Andy Butler. Attempt saved. Scott Wagstaff (Bristol City) right footed shot from outside the box is saved in the top centre of the goal. Attempt saved. Kieran Agard (Bristol City) header from the centre of the box is saved in the top centre of the goal. Billy Clifford (Walsall) wins a free kick in the attacking half. Goal! Walsall 1, Bristol City 1. 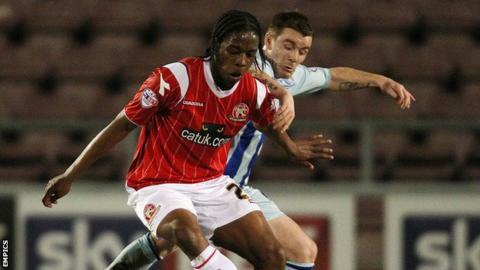 Romaine Sawyers (Walsall) right footed shot from outside the box to the top right corner. Corner, Walsall. Conceded by Joe Bryan. Substitution, Bristol City. Scott Wagstaff replaces Luke Freeman. Substitution, Walsall. Mathieu Manset replaces James Baxendale. Corner, Bristol City. Conceded by James O'Connor. James Baxendale (Walsall) wins a free kick in the defensive half. Attempt saved. Jordan Cook (Walsall) right footed shot from outside the box is saved in the top centre of the goal. Aden Flint (Bristol City) wins a free kick in the attacking half. Attempt missed. Joe Bryan (Bristol City) left footed shot from the left side of the box is close, but misses to the left. Corner, Walsall. Conceded by Derrick Williams. Attempt saved. Anthony Forde (Walsall) right footed shot from the left side of the box is saved in the top centre of the goal. Substitution, Walsall. Billy Clifford replaces Reece Flanagan. Attempt missed. Andy Butler (Walsall) header from the left side of the six yard box is close, but misses to the left. Corner, Walsall. Conceded by Aden Flint. Corner, Bristol City. Conceded by Anthony Forde. Attempt missed. Jordan Cook (Walsall) right footed shot from outside the box misses to the left. Anthony Forde (Walsall) wins a free kick in the defensive half. Attempt missed. Kieran Agard (Bristol City) right footed shot from outside the box misses to the left. Mark Little (Bristol City) wins a free kick in the attacking half. Attempt missed. Luke Freeman (Bristol City) left footed shot from outside the box misses to the right. Derrick Williams (Bristol City) wins a free kick on the right wing.